The name BLURRING clearly shouldn’t be a new name to some of you, but I understand if it is, so I’ll be doing my best in introducing you to this incredibly powerful and brutal super-group (let’s call them that). Of course I have a reason to call them a “super-group”, simply because if you’re even slightly interested in the Grindcore world, you’ll realize that after I list some of the band member names, how good this band really is. First off, I’d like to say that if you’re expecting classic, sharp, fast Grindcore, you are going to be disappointed. If by any chance you want something even crazier, even more brutal, and even faster and shaper, then you’re going to love what they have to offer. 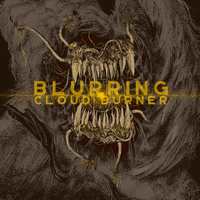 BLURRING are more of a Technical Grindcore-oriented group that add lots of elements to their music, and experiments with thing that are not often heard in this subgenre; but trust me, there are some people (including myself) that enjoy it more than they should. The band is originally from Rochester, New York (USA) and they have been active since 2012, releasing a fair amount of material until this very day, including demos such as “Jan.26 2013 Demo”, which is their very first official material, and “Live at Fedder”, a split between BLURRING, ZARNICA, and MAIN STRIKE; all of this in the year of 2013. Still, “Rat Bait” is the beginning, the actual beginning, music-wise; this was a 2014 demo that consisted of 4 songs. Finally, just a year later, their self-titled first full-length “Blurring” came out as an independent release, consisting of ten brutal songs, clocking in at around 27 minutes. This was the real breakthrough, the material that should’ve and could’ve been picked up by someone to get released and still it remained in the dark. Brutal artwork, malicious songs, and yet nothing happened. Nevertheless, “Cloud Burner” is the band’s newest material, and it officially came out on April 28th, 2017, and the fact that I’m only writing about this EP now proves how underground it is, and how unnoticed they manage to remain. Is that good you ask? Absolutely not! This EP consists of only five songs, but you guys need to realize that the band is made up of ex-SULACO, ex-LETHARGY, ex-KALIBAS, ex-BRUTAL TRUTH, ex-ANTHRAX and current members of NUCLEAR ASSAULT and WARBLADE!!! How did these guys remain so unnoticed?? All those bands are respected in the genre ( I have a few favorites in there by myself too) and they took all their stuff, formed this band, and released all this material, so someone’s got to recommend it to others, and I will gladly do so. “November” opens up the EP, with really harsh vocals, fast and technical riffs. One would expect all these songs to be pretty short, although that’s a false statement. The band is more than just a band in this genre because they’re a collective of effort, talent, brutality, and hard work. The drums, the bass-lines, the entire riff-work, and all the vocals on this track prove what I have been talking about. “Casket Black” is a different song since it focuses more on dissonant riffs, a dizzy atmosphere, and a general slowly approaching madness that this song contains. Although much slower than the previous one, the vocals still remain original, mad, sick and strong as hell. Once again, this is a three-minute-plus track to enjoy. The third track, and obviously my favorite (since Bandcamp won’t let me play it anymore) “Empty Heaven” even has a lyric video up on Youtube, full of sick lyrical content, gasmask terror, grey-dark atmospheres, and a pretty brutal musical landscape. Definitely my favorite one on the entire EP! “Flame From Form” is the second shortest track, though still containing a lot in its two and a half minutes. I must say that although I wasn’t familiar with the band earlier, they are somewhat of a perfect band for me, combining the elements of classic Grind core, lots of technicality from bands such as A MILLION DEAD BIRDS LAUGHING and a lot of Death Metal (that is mostly influenced by bands the members previously played in). The title-track and sadly last one “Cloud Burner” is spectacular, combining everything we previously heard into a massive, apocalyptic, short song. Not a lot left to say…if you guys like experimental, weird, but still amazing music, definitely throw yourselves into the entire discography by BLURRING!!! They absolutely deserve it.